Potts Research Group Blog: The number one invasive species in arid lands globally: Spekboom? The number one invasive species in arid lands globally: Spekboom? Spekboom (Portulacaria afra) does not appear to be invading in any arid land across the globe, or at least I can find no report of it being considered invasive. I find this simply astounding. Spekboom is an immensely popular garden plant and has been transported around the world by gardeners. This includes an influx into arid areas. In a recent visit to Arizona State University, USA, I cycled past rows of Spekboom hedges (example of spekboom in Phoenix here). A common theme on international gardening websites is how easy it is to propagate Spekboom from cuttings (note that most overseas websites refer to this species as "Jade" plants, but also lump Crassula ovata under this common name). Thus, we can rule out a lack of invasion simply because it is has not reached exotic destinations. One plausible reason that it may not have invaded arid lands, is that many arid areas are not only dry but also cold (i.e. experience frost events), and we now know that Spekboom is highly intolerant to frost events (Duker et al. 2015a, 2015b). Nonetheless, there are still plenty of frost-free arid areas. 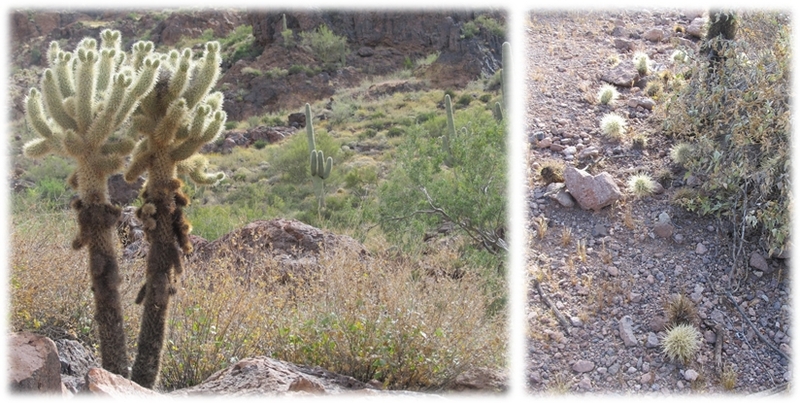 For example, the Sonoran Desert is predominantly frost-free, except in mountainous areas. The Saguaro Cactus (Carnegiea gigantea), an emblematic species of this desert, is sensitive to frosts (although likely to be hardier than spekboom). Parts of the Sonoran Desert experience winter and summer rainfall, similar to the native distribution of Spekboom in the Eastern Cape. The Sonoran Desert therefore seems like an ideal habitat for this ecosystem engineering species to invade and change the ecology of this landscape. Yet it hasn't. Why? I suggest that the reason is that it has no means of dispersal. Although gardeners routinely highlight the mass flowering of this species in overseas gardens as part of its aesthetic appeal, it appears that this is not sufficient for invasive propagation. As mentioned in a previous post, I have yet to find a small individual in the wild that I consider to be a true seedling (i.e. arose from seed and not clonally); this observation is also recorded by Stuart-Hill (1992). Other succulents that grow clonally have proved to be invasive (e.g. members of Opuntia). If we look at Cylindropuntia bigelovii, a native of the Sonoran Desert, which sheds stems with barbed spines that readily attach to, and thus are dispersed by, animals. These "cholla balls" readily take root and most cholla stands are clones of a single individual. Unsurprisingly, this species has become invasive in arid lands beyond its native range (Novoa et al. 2015). Cylindropuntia bigelovii, sardonically named the "teddy-bear" cholla - pronounced "CHOY-A", and the "cholla balls" that are shed around the parent plant. These either get stuck onto unwary animals, and thus are transported away from the parent plant, or simply take root in situ. So, why does Spekboom fail to disperse readily? I suspect that this species requires megaherbivores – specifically elephants (Loxodonta africana) – for effective dispersal. In the recently-opened southern sections of Addo Elephant National Park, elephants have readily removed invasive Opuntia infestations, yet Spekboom continues to flourish throughout the park. Elephants are fairly messy eaters, and will break off Spekboom branches and continue walking; and while they eat the branch there is a rain of dropping broken spekboom branchlets. Thus, not only does Spekboom survive elephant browsing, but I suggest that it is also dependent on it for effective dispersal of clonal propagules. The removal of elephants from the majority of their historical distribution may have had profound effects on Spekboom recruitment. This could be a factor explaining why recruitment is so incredibly slow in areas where domestic livestock pressures have been removed, but remain elephant free. So, in summary, my hypothesis is that the primary dispersal agents for Spekboom are elephants. If correct, there are a number of predictions generated from this hypothesis. Spekboom recruitment will be low wherever elephants are absent as elephants generate the bulk of the propagule dispersal events. Long-distance dispersal of Spekboom will be rare wherever elephants are absent. In this case, long-distance dispersal is in terms of meters to hundreds of meters. The exception to this may be on steep slopes where propagules are transported downslope by gravity. Observing elephant feeding behaviour and tracking the distance that elephants move with Spekboom branches. Observations of other animals, such as Greater Kudu, will also be necessary (but, admittedly, probably more difficult). Comparing the density of 'small' – i.e. recently recruited – individuals between the long-term browser exclusion areas and the general park. Simulating elephant browsing in a degraded spekboom-removed (and browser-free?) landscape, i.e. by seeding the landscape with lots of small bits of broken Spekboom, and recording recruitment. Note that Stuart-Hill (1992) suggested that Spekboom is adapted to elephant browsing, but proposed a model where spreading occurs vegetatively from side branches that take root and eventually form new individuals when connecting branches become detached. Duker, R., Cowling, R.M., Preez, D.R.d. & Potts, A.J. (2015a) Frost, Portulacaria afra Jacq., and the boundary between the Albany Subtropical Thicket and Nama-Karoo biomes. South African Journal of Botany, 101, 112-119. Duker, R., Cowling, R.M., du Preez, D.R., van der Vyver, M.L., Weatherall-Thomas, C.R. & Potts, A.J. (2015b) Community-level assessment of freezing tolerance: frost dictates the biome boundary between Albany Subtropical Thicket and Nama-Karoo in South Africa. Journal of Biogeography, 42, 167–178. Stuart-Hill, G.C. (1992) Effects of elephants and goats on the Kaffrarian Succulent Thicket of the Eastern Cape, South Africa. Journal of Applied Ecology, 29, 699-710. Ok, this is very odd; I've looked high and low to see if anyone else is having issues with Portulacaria afra invading their yards, and I seem to be the only one. I'm in Chicago, and every damn week I'm out in my garden plucking these bastards by the gallon-bucket, yet they still continue to come back. Perhaps they're not considered invasive in arid regions, but here in Chicago with our humid summers, Portulacaria afra continuously dominates my garden. It's worse than dandelions!